Optimized lock-on switch with integrated lock-on function for easy control. This machine works fine itself. I own an old car and it needed some work on it. 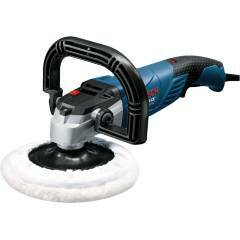 So using this polisher is a best experience. The adjustability of this polisher is perfect. Wow, ultimately I got a good, powerful and superior design polisher. Far better than Makita. In beginning you have to spin it slowly but after working on surface for sometimes, you can increase the spin speed. For me this is really idle polisher.